Melviana Johnson Fu Jailed For Stealing at Casino For 10 Months: Melviana would invite winners at casino tables to hotel rooms so as to steal their cash. 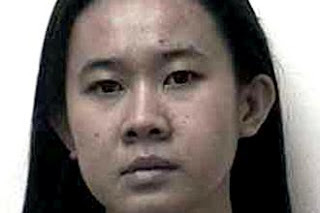 On one occasion, Melviana Johnson Fu, 30, even took the victim's pants probably to prevent him from giving chase. On Wednesday, a district court jailed her 10 months. Assistant Public Prosecutor Cyril Cheo said that in October 2010, she left Resorts World Sentosa casino with a 47-year-old businessman. While he was taking a shower, she left the hotel room with his pants and wallet containing more than $6,300. A district court jailed Melviana Johnson Fu to 10 months' imprisonment for stealing from men she met. She returned to the casino in December 2011 and got to know a 39-year-old punter. They had dinner and went to the hotel. He only discovered $22,000 missing from his wallet after he left her. He returned to the hotel room but it was empty. Also in December 2011, she accompanied a casino patron to his apartment and stole $4,800 from him.